If there is one thing that holds millions of people back each day from growing fear is definitely at the top of the list. High achievers, regardless of occupation, understand that taking risks and massive action is a vital part in getting from where you are to where you want to go. And that goes for in life — and in business. One thing I want you to understand is that fear is absolutely normal. 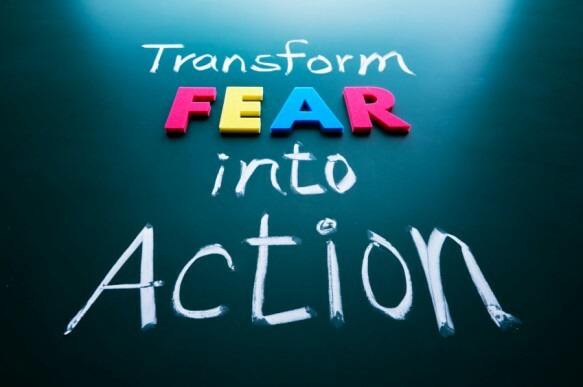 The key is to not let fear hold you back and prevent you from taking action and go after what you want in life. 1. Rewire your brain. Develop mantras and affirmations that build you up and increase your self-confidence. You want to interrupt the negative inner dialogue that goes on in your mind. 2. Have a well thought out plan. We begin to worry and over analyze situations when we don’t have detailed and well thought out plans for our life. Set extremely clear goals with a detailed plan on how to achieve those goals. Then take action.Taking action towards meaningful goals helps to relieve stress and gives you a huge sense of enjoyment. 3. Do things that scare you. It can even be something small that you choose to do, but step out of your comfort zone and work on becoming comfortable with the uncomfortable. When you form the habit of doing something that scares you, your courage grows little by little. Soon enough, the barriers that once were holding you back vanish and your potential maximizes exponentially.